One of the most interesting American contemporary artists doing brightly-colored surrealist paintings today is Casey Weldon. Using melancholy and humor, he plays with famous icons of modern pop culture, which led his critics to label his style as “post-pop surrealism”. Two main subjects of his work include highly detailed, multi-eyed cats as well as the mystical women who usually find themselves as the focal point of his artworks. Weldon’s work evokes a wide range of feelings within the viewer including nostalgia, fantasy and longing for old times. 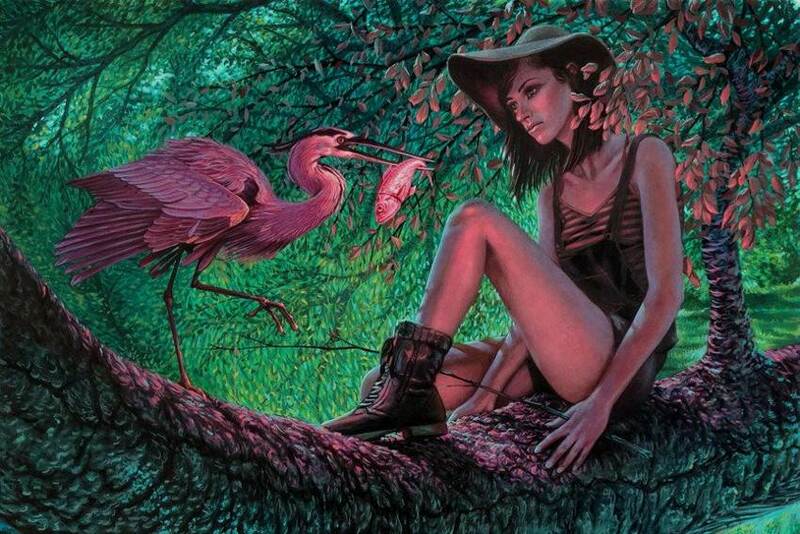 His signature style has graced galleries like Roq la Rue Gallery in Seattle, Hashimoto Contemporary and Spoke Art Gallery, both in San Francisco. Born and raised in southern California, Casey Weldon obtained his degree from the Art Center College of Design in Pasadena in 2004. After a brief time running his own studio in Las Vegas, Nevada, the artist moved to Brooklyn, NY, where he has developed his own unique style of painting. Ranging from internal commentary on the state of popular culture to a satirical analysis of the internet in general, Weldon’s work is witty and thrilling. Utilizing a bright, vibrating palette of psychedelic, mostly based on pink and blue hues, his paintings depict strange and dreamlike circumstances between people and the natural world, creating an astonishingly cinematic narrative that draws the observer into the story. 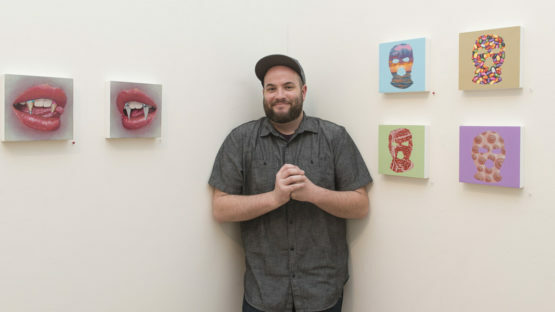 One of Casey Weldon’s favorite subject matters is a cat, as a way to make a comment on social media and the internet in whole. Through his thematic commonality of quadruple eyed animals, Weldon purposely immerses the viewer in charming yet eerily disturbing world and odd perspectives that transform the familiar into unknown. As a result, he reveals the truth of our ideals such as our obsessions with domestication and making everything we can submissive and adorable. Amongst his weird 4 Eyed Cats series, Casey gives shape to many other hybrid, unexpected objects, like meat cake, meat fruits and many more. Over the years, Weldon’s palette has gradually developed a neon-colored luminosity, resulting in a heightened sense of drama in a more vibrant yet limited palette – from extreme darks to blinding bright neons. His new subject matter makes associations between the fact that technology has changed a lot over the past several decades and that human civilization has become overly dependent on it. Weldon’s work has been included in shows and art fairs throughout the United States. The artist is represented by Spoke Art Gallery, located in San Francisco, CA. Casey Weldon currently lives and works in Brooklyn, New York.